Wesley Bush Jr. of Manpower waters wave petunia flowers. About 70 baskets are hung from lamp posts on Front and Park streets in downtown Traverse City, paid for by local developer Jerry Snowden’s business, Snowden Companies of Traverse City. This is the third year the company paid for the flowers, intended to “make downtown a more pleasant place to shop and a better place to be,” Snowden said. 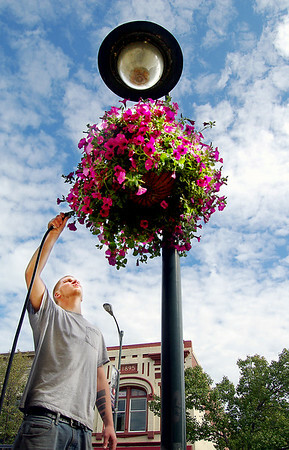 Plans are to expand the hanging flower basket zone further along Front Street and onto Cass and Union streets, he said. The city pays for the employee to water the baskets, said R. Ben Bifoss, city manager.